obvious exterior blemishes and might not have all the shelves and trays. Chances are you haven't shopped for a refrigerator in a while, so you may be surprised to discover many different styles and features. 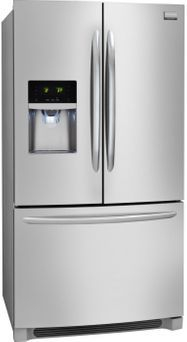 Check out this article and get more information below to help you find the perfect fridge. Your most basic option has a Freezer on the top and a fresh food section on the bottom or you could have the fresh food at eye level, so that you can spot those leftovers a lot faster. Side by sidegives you more freezer space so that you can store everything from pizzas, topeas, to popsicles. A French door has a lot of space for fresh food and you get the freezer on the bottom. Don’t forget about the outside the most popular finishes are White, Black, and Stainless Steel. Think about capacity, not only about how much you want, but will it fit in your space. It’s a great idea to measure your space, including your front door before you start shopping. 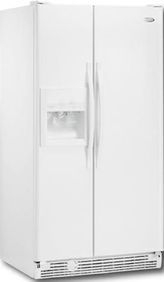 Features like adjustable shelves,temperature controlled drawers, ice maker, Energy saving models, or even dual cooling systems which allows freezers to circulate cool air separately from the fridge to help keep your ice from tasting like garlic bread. If you like one over another, go with your gut. If you want to know more about an specific brands they each have a website with extensive information about their newest models, features,prices, and where their brand is doing to make their appliances better. If all that just seems too complicated then ask your local appliance tech or salesperson. Ask questions about delivery,since not all stores policies are the same. Is your delivery and / or set-up included with a purchase? Are all the accessories included with the purchase or do you have to purchase it separately?